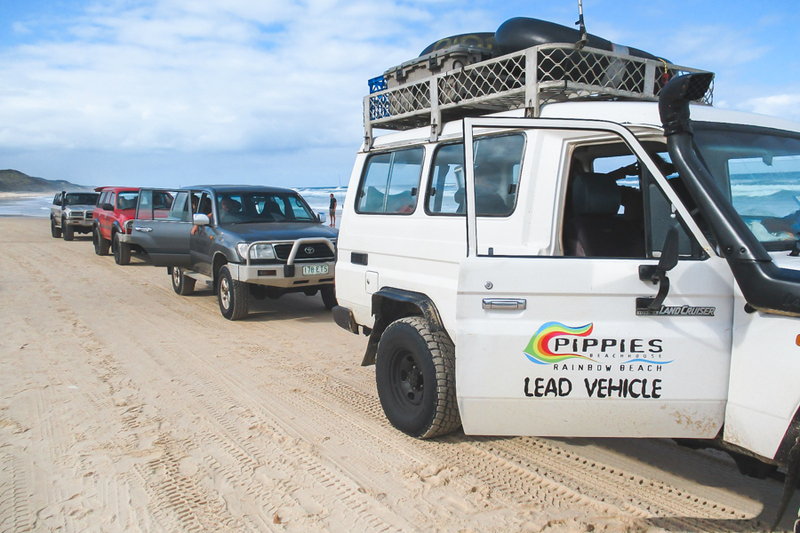 Want to experience the east coast's Fraser Island with an action-packed adventure on Pippies Tag Along Camping Safari. Ideal for travellers looking for an action-packed experience, visiting all of the amazing locations on this amazing sand island! With Pippie's private access to an amazing Sandblow and the permanent campsite with hot showers, Pippies ensure to take you on a memorable overnight trip! With the only private camp site on Fraser Island, the 3 Day Pippies Tag Along Camping Safari Fraser Island continues to be a favourite with travellers wanting a slightly different experience! By day you will take on an exciting itinerary including all of the highlight location as well as private access to an amazing sandblow site! Enjoy a camp fire each night! The itinerary for the day includes travelling along the 75 Mile Beach, visiting Lake Mackenzie and trekking through Central Station Rainforest and to top it off spend that afternoon relaxing at Eurong Beach Resort. Start day two includes a visit to Indian Head where you can take a swim in the world famous Champagne pools, followed by a visit at the extra special Maheno Shipwreck on the beach. Along the way, you see the amazing coloured sands of the Pinnacles and finish off the day with a visit to at Eli Creek. Revisit some of your favourite spots, including a visit to Lake Wabby located in Great Sandy National Park. Depart: Pippies Beachhouse, 22 Spectrum Street, Rainbow Beach every Monday, Wednesday & Saturday. Must attend 4pm briefing held at Pippies Beachhouse day prior to departure. Approximate departure time is 08.00 may vary depending on tidal conditions. All departures and itineraries are subject to weather. Tours may be changed or cancelled for any reason at the discretion of the Tour Operator. It should be noted that adventure travel involves risk. Whilst we make every effort to safeguard clients, we cannot be responsible for personal injury or loss due to actions of our clients which are beyond our control. on the confirmed date of departure. Please be aware operators pass on credit card merchant fees so there is a non-refundable 2.5% surcharge for VISA, MASTERCARD and AMEX card purchases. All client cancellations forfeit 25% of total ticket price and all client cancellations made less than 21 days prior to departure will result in complete forfeiture of the full price of the trip. If the company has to cancel the trip (prior to departure) and we cannot offer a suitable alternative, then a refund will be given minus card fees. We strongly recommend that you have travel insurance, especially during the wet season.